This is critical information that gives you the winning edge! Each DVD disc is divided into individual chapters so it is easy to find and watch the segments you want. Important points are highlighted in text and graphics on the screen to reinforce important information. 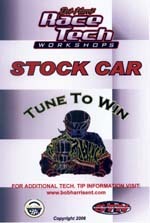 Review this seminar time after time and keep learning more every time to help you visit Victory Lane! Includes an 82-page Workbook. DVD format only.